Download the Python AWS IoT Greengrass Core SDK to your computer (not the AWS IoT Greengrass core device). You can download the SDK from the AWS IoT Greengrass Core SDK downloads. Decompress the downloaded SDK file. Obtain the Python Lambda function (named greengrassHelloWorld.py) from the decompressed SDK. Create a Lambda function deployment package named hello_world_python_lambda.zip that contains greengrassHelloWorld.py and the greengrasssdk folder. Use the Lambda console to upload the hello_world_python_lambda.zip package. Use the AWS IoT Core console to transfer the package to the AWS IoT Greengrass core device (during group deployment). Download the SDK from the AWS IoT Greengrass Core SDK downloads page. Locate the Python 2.7 section, and choose v1.3.0 - current version to download the SDK. Decompress the downloaded greengrass-core-python-sdk-1.3.0.tar.gz file so you can get the Lambda function code and the SDK. For instructions, choose the tab that corresponds to your operating system. Use a tool for decompressing .tar.gz files on Windows such as 7-Zip, WinZip, or similar. For example, the following steps use 7-Zip. After you install 7-Zip, use Windows File Explorer (Windows logo key + E) to navigate to greengrass-core-python-sdk-1.3.0.tar.gz, right-click the file, choose 7-Zip, and then choose Extract Here. This creates the greengrass-core-python-sdk-1.3.0.tar file. Right-click the greengrass-core-python-sdk-1.3.0.tar file, choose 7-Zip, and then choose Extract Here. This creates the aws_greengrass_core_sdk folder. Expand the aws_greengrass_core_sdk and sdk folders, and then unzip python_sdk_1_3_0.zip. Using Finder, navigate to the greengrass-core-python-sdk-1.3.0.tar.gz file and double-click it. This creates the aws_greengrass_core_sdk folder. Open a terminal window and navigate to the directory that contains the greengrass-core-python-sdk-1.3.0.tar.gz file. This creates the aws_greengrass_core_sdk directory. The greengrassHelloWorld.py file in examples\HelloWorld. This is your Lambda function code. The greengrasssdk folder in sdk\python_sdk_1_3_0. This is the SDK. The following code is from greengrassHelloWorld.py. (To save space, all code comments have been removed.) Note that every five seconds, the function publishes one of two possible messages to the hello/world topic. Copy greengrasssdk to the HelloWorld folder that contains greengrassHelloWorld.py. To create the Lambda function deployment package, save the greengrassHelloWorld.py file and the greengrasssdk folder to a compressed .zip file named hello_world_python_lambda.zip. The .py file and SDK folder must be in the root of the directory. Depending on your distribution, you might need to install zip first (for example, by running sudo apt-get install zip). The installation command for your distribution might be different. Now you're ready to create your Lambda function and upload the deployment package. Open the Lambda console and choose Create function. For Runtime, choose Python 2.7. For Role, choose Create new role from one or more templates. For Code entry type, choose Upload a .zip file. 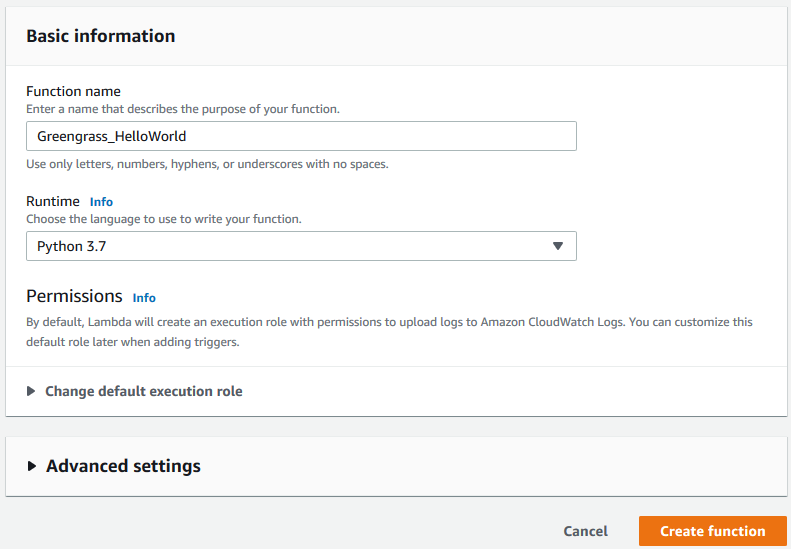 The Test button on the AWS Lambda console doesn't work with this function. The AWS IoT Greengrass Core SDK doesn't contain modules that are required to run your Greengrass Lambda functions independently in the AWS Lambda console. These modules (for example, greengrass_common) are supplied to the functions after they are deployed to your Greengrass core. To see your uploaded code, from Code entry type, choose Edit code inline. 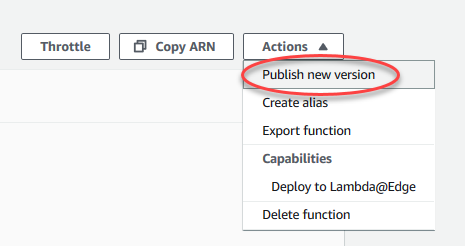 From Actions, choose Publish new version. 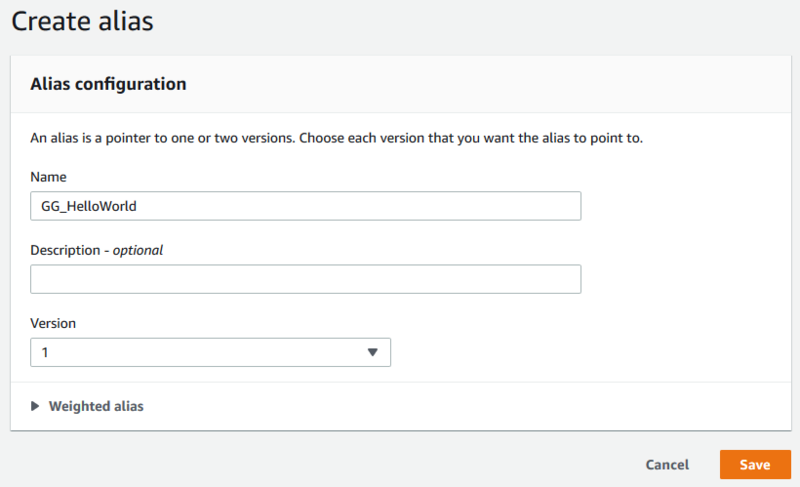 For Version description, enter First version, and then choose Publish. Greengrass groups can reference a Lambda function by alias (recommended) or by version. Using an alias makes it easier to manage code updates because you don't have to change your subscription table or group definition when the function code is updated. Instead, you just point the alias to the new function version. 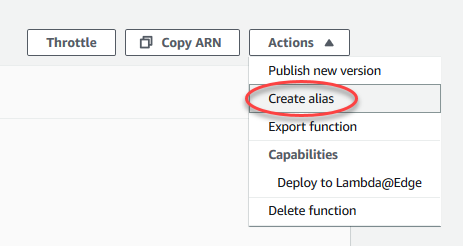 From Actions, choose Create alias. Name the alias GG_HelloWorld, set the version to 1 (which corresponds to the version that you just published), and then choose Create. AWS IoT Greengrass doesn't support Lambda aliases for $LATEST versions.